This must be the day for extremes in hair ! I just wrote that post about doing my older daughter’s hair and posted it. As soon as I hit Publish, my younger 12 year old daughter came into the room. Anyway, somehow she got this comb completely tangled up in her hair. I tried to get it out and the hair was so tangled and wrapped around the comb that I could not do it. 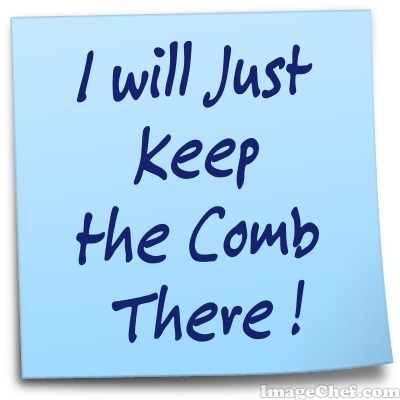 The comb was just sticking out of the front of her forehead, with a tangled mess of hair around it. She has such beautiful hair too ! I started to cry…I think everything is catching up with me, and the thought of having to chop off all of the hair on the front of her head, was too much. She said “Mom, why are you crying? It is MY hair.” and she gave me a big hug. She said we have to cut it out. I tried again to untangle, but I knew she was right. We were going to have to cut the hair. So, I very carefully cut a few strands at a time. I worked out the pieces that I could and I cut the ones that I had to. I tried to see where each strand was coming from so that I would keep as much length as possible. It was hard to tell where things started and where they ended. Finally we got the comb free and pieces of hair fell to the floor. I then trimmed the front of her bangs to make them look okay. I angled the sides to match. She actually really likes the new cut and she is happy. Shew ! I guess it turned out alright after all. Tomorrow, I will trim up the back and layer it. The she will have a whole new look, which is what I think she was going for in the first place.